The insurance industry is facing multiple forces of change - rapid digitization, changing demographics, rising customer expectations, challenging economic environment and expanding risk of sophisticated fraud. To be successful, insurers need to develop deep capabilities around engagement of customers and other stakeholders, effective decision making, discovery of new ideas and management of profitability. But many insurers lack the analytic tools and other assets needed to be a market leader. Many insurers struggle to meet customer expectations for engagement and personalization, to calculate risk and profitability at a granular level, and to make timely, accurate decisions. Cognitive computing can address these challenges and open up fresh opportunities for insurers by harnessing insights hidden in data from across the organization. Insurance executives believe cognitive computing will change the face of the insurance sector, and they intend to invest in cognitive capabilities. 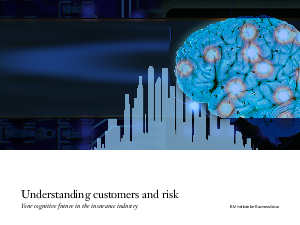 To successfully implement cognitive computing, insurers first need to build a cognitive vision and roadmap.